Darth Vader isn’t as tall as I thought he would be…. Yoda from behind looks like a taxi cab with the doors open. A small green taxi cab, but a taxi cab nonetheless. My intergalactic transfer may explain my drop in numbers this past week…. and overall I stand at 329 and 88 or a subpar 79%. But this is no time to look back because it is the Third Saturday in October. And simply put, that means War. I know a lot of folks in south Georgia love their Blazers from Title Town.. But this is the year of the Lion..
Coach Bobby gets back on track this week.. EDITORS NOTE: This may explain their inability to hit a stationary target with artillery. You don’t really care about this game do you? But I am convinced Superman really does wear number 15. I have no idea what this Mexican kid is thinking..
Joe Pa will melt her like the wicked witch of the west with the powerful magnification of his reading glasses. Go ahead, Dare him too. I knew a rich kid when I was in school named Brevard..
All that National Championship and Heisman Trophy talk seems kind of silly now, doesn’t it? I was told Moccasin Bend is the Mental Heath Hospital on the Tennessee River. Does that make the Moccasins crazy? You want to know what I find interesting about this game? Coach Stoops should have started Bradford later than sooner. This game is going to be uglier than when we trim my sister-in-law’s foot that looks like a hoof. This game will be a battle from start to finish…. The Baylor School of Medicine is one of the finest in the country. The Game is played annually for the Bucket of Nails..
Because this game will be the final nail in Coach K’s career at the Ville. So I have to go with.. I won’t miss this week.. EDITORS NOTE: Is it my fault all those ink pictures look like midgets riding possums with wings? I think I made my point.. This may not come as a surprise to many of you..
Last Night it was erroneously reported the Blue Devils had a “Big” Pep Rally in honor of this game. I would like to clear up that misunderstanding for you readers. Unfortunately the Pep Rally was for the “Math-a-maniacs” team, not the football team. I wish this were an upset special…. You want to know what “victory” smells like in Morgantown. You know what Big Ten games mean right? That’s right, another Big Rivalry for a Trophy! Has the inside track on the Vienna Sausage Bowl in Dahlonega Georgia. The Commodores are down and Steve’s Boys are destined to rebound…. My Dear, Loyal Aggie faithful…. Do you want R.C. Slocum’s cell number? The Gophers may be O’ So Golden…. But the Buckeyes have a mean on this week…. Another Big Ten Rivalry Game! I cannot in good conscience give out my buddy’s personal information. Toe Nail Fungus Bowl in Minot North Dakota. This old rivalry has more trophies and titles than Carter has Liver Pills. They could simply this whole process if they just played this game for the coveted.. The pain still lingers for me…. Everybody knows I love those Falcons…. I was going to watch this game but I heard Wynonna Judd is going to wrestle a Black Bear on Pay-per-View. I am sorry, that’s can’t miss entertainment. YES! Another game for a “Trophy” in the Big Ten! But the altitude and the Cougars can’t stop the horned amphibians. But I am partial to Mike the Tiger…. The only good thing about this game.. 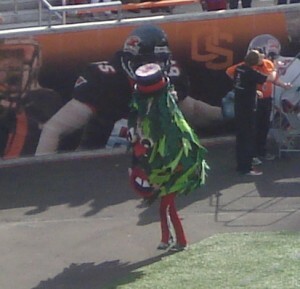 EDITORS NOTE: For those of you wanting to object to my observation and believe Evergreen State has the dumbest mascot, they hold the distinction of the “grossest” mascot. Glad I could clear that up.. Thanks Beaver Jim for the disturbing photo.. I bet Averett is a Methodist too. purchased with his “stimulus package”. Glad you enoyed it Miss Kaye….